From New Zealand, Serotonin is a trio that plays intrumental psychedelic jam rock. The band consists of Andrew Coy on guitars, Hamish Anderson on bass and acoustic guitars, and Glenn "Babymash" Fletcher on drums, percussion, and xylophone. This is their third release, the first two being band-released CD-R's. 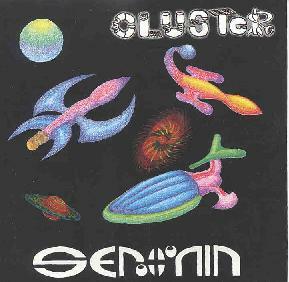 I haven't heard their first two releases, but the music on "Cluster" doesn't vary a whole lot. Coy's guitar alternates between a crunchy jamming power trio style and a drifting psych style that reminds me of King Black Acid. If Serotonin could be said to have a trademark sound it's to be found in their rhythms which are fairly consistent througout. Fletcher's capable, and often varied, percussion keeps a solid beat and contributes to what variety is to be found across these tracks. Still there's some good rockin' psych to be found here. The title track has a short but aggressive bubbling freakout segment that dissolves into a floating melodic finale that I really enjoyed. "Neurotransmitter2" is another tune that grabbed me with its drifting acoustic and electric guitars and an ever-present heart-pounding bass line. The track builds slowly in intensity to a driving rhythmic pattern alternating between the raw crunchy rockin' psych sound and the more drifting guitars. But of the seven tracks on this disc the one that is really killer is "Southerly Front", the closing track. The guitars build slowly to a feverish frenzy, like an extended intro with bells tinkling in the background. When the rhythm section kicks in the guitar switches to dreamy wall of sound mode and Coy cranks out the most varied and enjoyable guitar work I've heard yet on this disc. Ten gorgeous minutes of jam, slam, and drift. Serotonin clearly has the stuff to be a solid heavy psych band but they're going to need to vary things a bit if they intend to remain instrumental. You can visit Serotonin at their web site.